This article originally appeared on the Examiner website. In 1990, Anthony Zuiker was just another Hollywood wannabe — a balding, overweight guy driving a tram in Las Vegas for eight bucks an hour, telling his friends about the screenplay he was writing, dreaming of fame. He’d grown up in Vegas, where his mother worked the blackjack table at a casino, while his father flitted back and forth from investment schemes that didn’t seem to go anywhere. His friends figured Anthony wouldn’t either. But 20 years later, Zuiker stands as the mastermind behind the most popular television show in history, CSI: Crime Scene Investigation, and its spin-offs: CSI: Miami and CSI: NY. 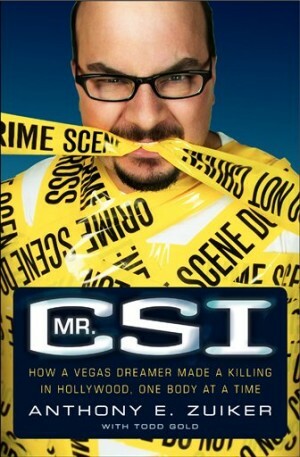 How he got there — a remarkable rise from nothing to something — is the narrative lifeblood of Mr. CSI: How a Vegas Dreamer Made a Killing in Hollywood, One Body at a Time (Harper, $26.95), only, like the show itself, there’s a catch. On a January morning in 2005, Zuiker got a call from the Las Vegas Police Department while he was working at his desk on a script for “CSI: NY.” His estranged father, whom Zuiker hadn’t seen for a decade, had put a shotgun in his mouth and pulled the trigger. So begins Mr. CSI, a book that frames Zuiker’s astonishing ascent to fame and fortune with an unsettling and honest appraisal of his father’s suicide. Like a script for one of his TV shows, the book opens with a Crime Scene Investigation Summary from the Las Vegas Police Department, detailing the discovery of an apparent suicide. The report is real: the body belongs to Zuiker’s father, Eddie, dead from a self-inflicted shotgun wound. It is the morning after CSI’s triumphant win at the People’s Choice Awards that Zuiker gets the call from the Vegas police. Yes, he tells them, Eddie Zuiker is his father and, as his sole next of kin, he has no choice but to fly to Vegas to handle the affair. Mr. CSI is a non-conventional memoir that uses the conventions that have made CSI a worldwide success to tell a far more personal story, of what one man left behind in his success and what he gained when he returned.